I’ve reviewed quite a few books – most of which are on spend management or negotiation. Some have made me laugh, like Negotiation Mastery and Profitable Buying Strategies. A few have made me cry, and those will remain unnamed here. But I don’t think I’ve ever felt compelled to review a single chapter from a book until now. 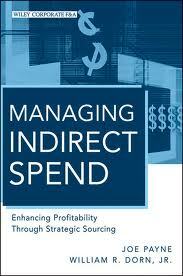 I’ve read ‘Managing Indirect Spend: Enhancing Profitability Through Strategic Sourcing’ by Joe Payne and William Dorn, a number of times. I’ve read it cover to cover at least once, but there are several chapters I return to again and again as reference material. As a matter of fact, the book has become such a reference source I realized I’ve never actually reviewed it as a whole. The chapter I’d like to focus on here is 10: The Importance of Market Intelligence. Sadly, I knew it was chapter 10 I would be writing about without checking the table of contents. Everyone in procurement can easily agree that market intelligence is key to the sourcing process. But how thorough is your process and how much influence do you let it have over the project itself? Is your market research simply identifying new suppliers to bid or do you use it to drive the cost models that form the core of the pricing, negotiation, and contracting process? So market intelligence is macro as much as it is micro, and it incorporates long and short-term pricing and availability drivers. In my opinion, the challenges of gathering market intelligence are that it takes time and consideration and isn’t as easy to check off a project schedule as something simpler, like identifying new suppliers. It is not obvious when you are done, and it needs to be gathered at a time in the project when internal stakeholders are getting edgy to get going and see tangible results rather than something that resembles the philosophy of procurement. If we cave to that pressure and short change the market intelligence gathering process, we hold ourselves back in a number of ways. - We limit our understanding of the product/service being purchased as well as the alternatives and are overly reliant upon incumbent suppliers for pricing structures and cost models. - We lose the opportunity to know whether a supplier’s claim that market forces are negatively affecting their pricing is a valid statement or just a negotiating tactic. - We are unable to take market forces and trends into account when we establish the success metrics for the project. Finally, we allow ourselves to be boxed into the tactical execution role we are trying to hard to escape. If we are truly to be strategic, we are entitled to a little procurement philosophy now and then – as long as it is clearly tied to the ultimate success of the project. The rest of the book deserves a review of its own, and I’ll add that to my list. In the meantime, I highly recommend picking up a copy, and opening to page 191. Before long, it will automatically split open to that page, just like my copy does.